So starts the diary of Will Henry, orphan and assistant to a doctor with a most unusual specialty: monster hunting. In the short time he has lived with the doctor, Will has grown accustomed to his late night callers and dangerous business. But when one visitor comes with the body of a young girl and the monster that was eating her, Will’s world is about to change forever. The doctor has discovered a baby Anthropophagus—a headless monster that feeds through a mouth in its chest—and it signals a growing number of Anthropophagi. Now, Will and the doctor must face the horror threatening to overtake and consume our world before it is too late. The main reason I bought The Monstrumologist last year was because of the cover. I thought it had a very good and creepy design, and the title’s font made it seem like someone was whispering it to you — “The Monstrumologist“. I didn’t really know what it was about, but I relied on the Printz medallion on the cover and believed it was good. Every time I see this on my shelf I felt like someone was whispering to me, but I never got around to reading it for so many reasons. When Aaron read it and said it was “…the type of book that should come with a warning: Caution: Not for the faint heart or weak stomach – that sort of thing”, I put it down further my TBR, thinking I’ll read it when I’m ready because I am so not the one who goes for gore. But alas, I’m pretty easy to bully when it comes to reading, so when my October Required Reading came around, I had no choice but to put this on my reading list. You’d think The Monstrumologist is a pretty easy-peasy not-so-scary YA novel about monsters. You’d think. Twelve-year-old Will Henry is left orphaned after his parents died in a fire, and he was taken in by his dad’s employer, Dr. Pellinore Warthrop. Warthrop is not an ordinary doctor — he is a monstrumologist. Warthrop is self-absorbed, often buried in his work and has young Will Henry at his beck and call. One night, a grave digger arrives at their doorstep bringing the most curious package: the cold remains of a young girl that is being devoured by a very terrifying and a very dead monster. It was an Anthropophagus: a monster shaped like a human but with no head, mouth on its stomach and black eyes on its shoulders. Anthropophagi feed on human flesh, but that is not the most curious thing that got the doctor wondering. Anthropophagi are native in Africa, so finding one in New Jerusalem was the singular curiosity — never mind that finding scary man-eating monsters was already the strangest thing for young Will Henry. Now it is up to the doctor and Will Henry (and some “friends” — and I use the term loosely) to figure out how these man-eating monsters got there, and to stop them before they go on an eating spree. The Monstrumologist is a very vivid and well-written gothic horror novel and I have never been more captivated by a book like this. It was creepy scary all right, but it was so good that I could not stop reading it even if it was in a dark and moving jeep (while everyone was telling scary stories). Despite my misgivings and initial hesitation, I actually ended up loving this book. To say it was well-written is an understatement. It was extremely well written. The story was basically being told in from the point of view of the older Will Henry recalling memories of those scary nights, there was excellent foreshadowing and it made me fear for what could happen to the story. I remember having to stop a couple of times to take a breather or to shudder and squirm at how gory some parts were. But it wasn’t just pointless gore — the story was quite engaging as well. The characters were very fleshed out, and I especially loved the relationship between Will Henry and the doctor. It was strained, but also I think they were just having a hard time showing how important they were to one another. I especially liked the last scene in the book, and if you’ve read it, I think you will also find it a bit heartwarming. I think The Monstrumologist would fare very well not just a book but also as a movie. I could clearly imagine the final chase scenes of the book as a motion picture. 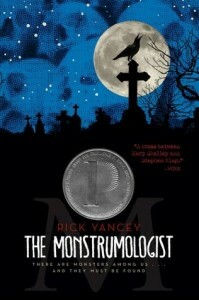 Like I said, I’m not a fan of anything horror, but The Monstrumologist by Rick Yancey may just have made my best of 2011 list. :) And it’s so good that I am actually reading the next book in the series (but this is because I got semi-bullied into reading it :P). One final anecdote: soon after I finished reading this book, the electricity at home went out. I found myself straining to hear the hiss of the Anthropophagus in the silence and total darkness of the night. If that is not an effect of a great novel, than I do not know what is. If you haven’t read The Monstrumologist, well, snap to!